I’ve been following the exciting Hubble Space Telescope (HST) Servicing Mission 4 (SM4) that began this week with the launch of the space shuttle Atlantis on May 11, 2009. It is exciting because there was a good chance that the mission might not have taken place at all due to the increased risk from space junk in the same orbit as the HST. But after lengthy deliberation, the mission was finally a go, and the astronauts are now busy at work upgrading and repairing the HST. The mission is supposed to prolong HST’s life another 10 years. The 11 day SM4 is the final service mission for Hubble. The HST means a lot to me. There’s nothing in astronomy today that captures my imagination like Hubble does. Heck, I always thought that one day when I get a dog (my preference is a Chow-Chow) I’d name it “Hubble,” like “Hubble the bubble” in reference to a Chow’s puffy look. The Hubble represents humankind’s crown achievement in terms of visible light astronomy. Some of the most mesmerizing photos of the cosmos have come from the HST. My favorite of all time is the Hubble Deep Field (HDF) image that was assembled from 342 separate exposures taken with the Wide Field and Planetary Camera 2 (WFPC2) for ten consecutive days between December 18 and 28, 1995. Gazing into the small field of this image, Hubble uncovered a bewildering assortment of at least 1,500 galaxies at various stages of evolution. Whenever I stare at this photo, I’m in awe with what it represents, hundreds of galaxies each with billions of stars, each star with the possibility of a planetary system, each system with the potential of an Earth-like planet. 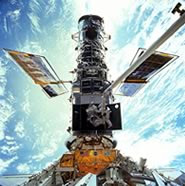 So as the mission specialists perform their spacewalks to refurbish the Hubble, I feel as if the old dame of astronomy is being given a breath of fresh air as it will continue to open up new vistas for the world’s astronomers. I know from talking to scientists who manage to obtain HST time, it is considered quite the rite of passage for an astronomer. The mission replaces all six of HST’s ailing gyroscopes, provides fresh batteries, repairs the Advanced Camera for Surveys (ACS), installs the new Cosmic Origins Spectrograph, and much more. Hubble’s successor will be the James Webb Space Telescope (JWST) that is scheduled to launch in 2014. JSWT is a large, infrared-optimized space telescope that will find the first galaxies that formed in the early universe. JSWT will have a large mirror, 6.5 meters (21.3 feet) in diameter and will reside in an orbit 1 million miles from the Earth versus the 353 mile orbit of Hubble. So after the successful completion of SM4, you can look forward to years of even more exciting glimpses of the distant universe coming from a revived HST that will go down in scientific history as the experiment that gave humans their most significant and most powerful view of the cosmos. With any luck, the new Hubble will feed the imagination of a whole generation of children in the potential of scientific discovery.